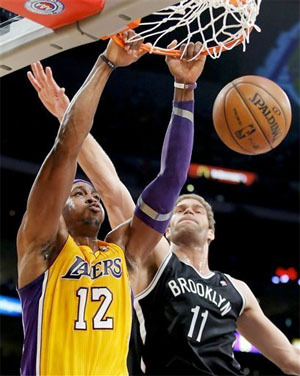 Dwight Howard grabs a rebound against Kings. The By The Numbers recap for the Lakers’ 103-90 win over the Sacramento Kings at Staples Center on Sunday night. The Lakers are now 3-4, and next play home to San Antonio on Tuesday night. The number of free tacos Jack in the Box will have to give out after the Lakers held yet another opponent under 100 points on Sunday in the win. The number of rebounds Pau Gasol and Dwight Howard have grabbed combined this season. Just looked like a nice number to mention. That is of course over 10 per game, and is sure to improve as Howard gets his legs back. He had his Laker career-high with 18 boards Sunday. To keep in the rebounding mode, the number offensive rebounds the Lakers have grabbed this year through the first seven games. That’s nearly 15 a night…impressive. Jordan Hill grabs 3.5 off the bench alone. The combined number of points the Lakers starting five scored minus Steve Blake scored. Even more impressive was they shot 27-54 (50%) from the floor as well. Dwight Howard led all scorers with 23 points, to go along with his 18 rebounds and three blocks. The percentage of shots the Kings missed on Sunday, hitting only 36-90 from the floor, including a miserable 1-10 from Marcus Thornton. Laker opponents are shooting just 42.4% from the field for the season. The number of minutes it took Jason Thompson to foul out against Dwight Howard. I know that’s a lot minutes, but so what, it’s a fun stat to mention. In one of the poorer stats of the night, the amount of points the Lakers bench scored. They struggled again except for Jordan Hill and Darius Morris, who continue to lead the reserves with solid play. Antawn Jamison had another tough night…no points and only two shot attempts. The number of minutes it took the Kings’ Jimmer Fredette to score 18 points…wow! He went 7-9 from the floor, 3-5 from beyond the arc, and 1-1 from the line. Pretty impressive stat line. The Lakers current winning streak. Hey it’s better than a two-game losing streak. More numbers after San Antonio on Tuesday! Dwight Howard gets fouled going to the basket. The By The Numbers recap for the Lakers 108-79 win over the Detroit Pistons at Staples Center on Sunday. The Lakers are now 1-3, and play next at Utah on Wednesday night. The amount of points the Lakers scored on Sunday night, their best offensive output of the season thus far. They also shot 51.9% from the floor and are shooting 50.3% through the first four games. The amount of points the Lakers starters scored against the Pistons, with four of the five in double-figures, led by Dwight Howard’s 28 points on 12-14 from the field. The percentage of threes the Lakers made Sunday, hitting 10-22 from beyond the arc. So far this season, the Lakers shooting from the 3-point line has been impressive at 40.6%, with Steve Blake leading the way hitting 5-8 for 62.5%. The percentage that Detroit hit from the floor, making just 28-79 shots. 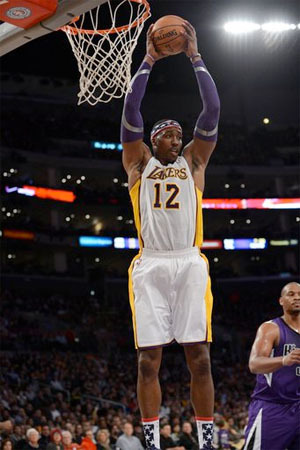 Think about this…Dwight Howard, Pau Gasol, and Metta World Peace made 25 baskets by themselves. The amount of minutes Kobe Bryant played Sunday, which makes all Laker fans happy. Kobe played 43 minutes Friday against the Clippers, and with a strained foot he doesn’t need to be logging so many minutes this early in the season. He got much needed time off against Detroit, only needing to take 10 shots as well. The Lakers led at halftime on Sunday 62-34, which was easily their best performance in any half this season. They didn’t let up much in the second half, as they increased the lead to 36 at one point, before winning by 29. The amount of turnovers committed by the Lakers Sunday. Might not seem like a big deal, but when a team commits 59 turnovers in their first three games, 15 sounds a lot better. Also keep in mind, many of those 15 came in garbage time with the game out of hand. The Lakers did protect the ball relatively well all night. The Lakers’ current winning streak. Hey, have to start somewhere! See you guys Wednesday after the Utah game. 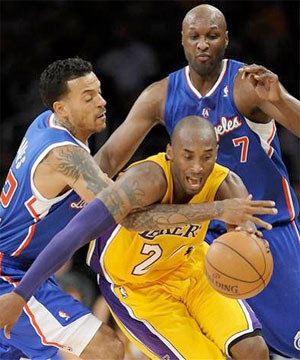 Kobe battles through double-team against Clippers. The By The Numbers recap for the Lakers 105-95 loss to the Clippers at Staples Center on Friday. The Lakers are now 0-3, and next play home to Detroit on Sunday. The amount of steals Kobe Bryant has in his Lakers career, after picking one up against the Clippers. He passed Magic Johnson for first all-time in Lakers’ history. The number of points Lakers’ opponents are averaging through the first three games of the season. The number of turnovers the Lakers have committed in the first three games this season, including 45 combined in the last two against Portland and the Clippers. The number of points the Lakers’ bench has scored in the first three games of the season. No player has yet to score in double-figures off the bench either. The number of points Kobe Bryant scored on Friday, on a brilliant 14-23 from the field and 10-10 from the foul line. 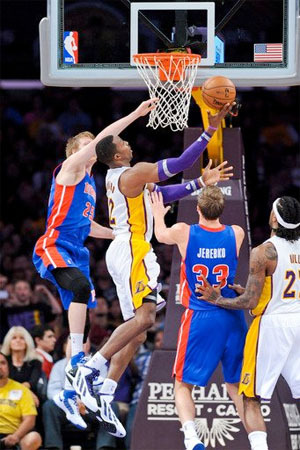 Problem was he got little help, as three Laker starters had at least five fouls, including Dwight Howard. Kobe is shooting an amazing 61.4% from the field, and 94.1% from the line through the first three games. The number of years since the Lakers last started a season 0-3. You want to know how that season ended? Here’s a hint, not with a championship. Magic Johnson was drafted #1 by the Lakers the next season, and the rest is history. The number of points Steve Nash and Antawn Jamison have scored combined this season. Granted Nash didn’t play on Friday night, but it is highly unlikely that anyone saw those numbers coming. The number of assists that leads the Lakers. While that number certainly isn’t impressive to begin with, what’s really disturbing is that Steve Nash isn’t the guy that has them. Both Pau Gasol and Steve Blake lead the team with those 11 assists. Nash has just eight so far this season in his two games. Let’s hope next game’s numbers are a lot more fun to talk about, besides Kobe’s record steal of course.